The paper introduces a new methodological perspective to the process of urban design, which reacts to the increasing interdependence of multipe scales in almost all facets of life. The production of place in the contemporary urban context calls for a new conception of space. We conceive space as the result of physical and non-physical activities and their relations across scales and over time. Based upon this understanding, we have identified five key competencies that might support the relevance and scope of urban design. Thus, urban design can neither be understood as a purely physical task nor as a purely social one. It needs to be rooted in the present but pointed towards the future. It is the combined result of a multitude of interventions into space and society. These need to consider strategically their short-, medium- and long-term impact. Only then, design can be medium for debate between decision makers, planners, institutions and the general public. Thinking about the production of place in the contemporary urban context calls for a new way of conceptualizing the resources for place making. The mutual interdependence of multiple spatial levels in almost all facets of life challenges urban practice by places being construed through the interrelatedness of scale levels. Virtual connectivities and processes reaching beyond the local context shape the reception of morphological and functional qualities of place. The paper introduces a new methodological perspective to the process of place making based upon a distinct understanding of space. The first section lays out our relational conception of space. The second part elaborates on the significance of a relational approach to urban design. Based upon a multi-dimensional understanding of urban design five key competencies are identified that foster the transformative capability of urban design in urban environments. By means of two case studies set in different development stages and scales, the third section will illustrate our theoretical framework for the urban design practice. The fourth section evaluates the new knowledge created and highlights the potentials of such an approach for the production of place across the presented case studies and beyond. In conclusion, we propose a new perspective to urban place making which we call urban strategy making, which is process-based as opposed to product-based and allows for a dynamic development perspective on urban space. Space is the result of multiple processes of generation, formation, emergence, development and implementation, which evolve on various scales. Different spatial qualities emerge as temporary products of overlapping processes. Human interaction is restrained and enabled by many different spatial features such as distance, connectivity, accessibility or functionality. The denser and the more heterogeneous the concurrent processes are, the more complex the conception of place becomes. Boesch () distinguishes three interrelated levels of space: material or distance space, function space and process space (Boesch, :100). 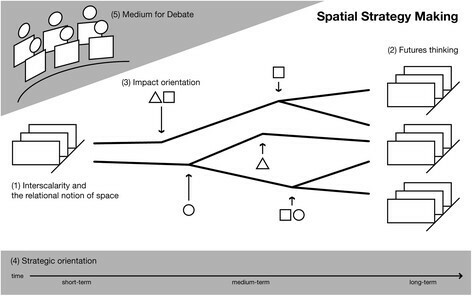 Distance space relates to how physical spaces are configured and related to each other (Gustafsson, :225). Functional space refers to the possibilities of physical space supporting the actions or tasks to take place within it (Gustafsson, :225). Urban space is constituted by the relation between its physical substance and its non-physical flows as well as its position and meaning in the global network of interrelations (Lefebvre, :341). The product – urban space – is created and constantly recreated by processes of production and consumption, which imprint on the physical and non-physical environment of the city (Löw, :198). However, physical spatial configurations rarely evolve at the same speed as non-physical spatial attributes. Although place is a temporary state in a network of ever-changing social relations on multiple scales (Madanipour, :23), the existing physical configuration predefines spatial potential and can become an inertia for development. It is therefore critical to understand the “relational complexity” (Healey, :534) between form, function and time. While the physical configuration of the city is set by various interrelated but also distinct scales – the plot, the quarter, the city, the region, potentially even the polycentric mega-city region (Thierstein et al. :47) the functional flows span across multiple scales and across different points in time. 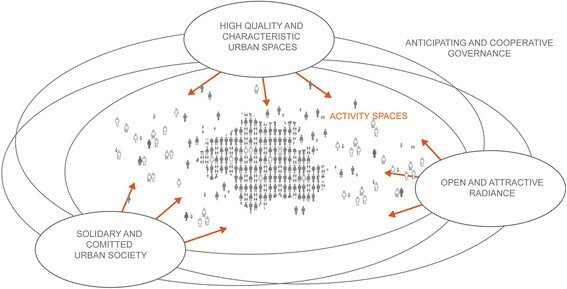 The key challenge for place making is to combine these relations between spaces for their mutual benefit. They critically affect the flow of knowledge, goods and people and are intrinsically linked to the historic, present and future form of the individual city (Graham, :312). Although we conceive place as a multidimensional concept, we claim that urban design has to play a key role for urban development. Urban design as a field is located between architecture, urban planning and other space-related disciplines and has the power to overcome the fragmentation of urban development generated by the disciplinary divide. Nonetheless, well-established instruments in the field such as large-scale comprehensive master plans are increasingly questioned. Concurrently, a more strategic, intervention-based approach to urban design, which is supported by a collective learning endeavour, gains significance. Against this background, we have identified five key competencies that might support the relevance and scope of urban (Alaily-Mattar and Thierstein, ) (Figure 1). Five complementing competencies to urban design. Urban design can neither be understood as a purely physical task nor as a purely social one. The individual urban design intervention has an impact on other spatial dimensions, which are catalysed through specific rules and resources. These resources are non-transferable, non-tradable and locally specific because they are either embedded in their spatial context or the result of place-specific relational forces. Physical and non-physical accessibility is therefore critical. “There exists no place that can be said to be delocalized; everything is sent from one place to some other place, not from one place to no place” (Latour, :179). (2) Thus, urban design needs to be rooted in the present but pointed towards the future, it needs to respond to global challenges and draw on global resources as well as local needs and conditions. The task is to generate potential, create possibilities and cause events, which propel sustainable development (Koolhaas et al., :969). Therefore, urban designers need to be concerned with “futures” (Cole, :373). The plural of future highlights the fact that urban development is not “a single grand vision or an inevitable consequence of trends” (Wachs, :372). Thus, (3) it is the combined result of a multitude of interventions into space and society over time. We therefore need to start thinking strategically about place making by both envisioning possible alternative futures and designing interventions to facilitate the most desirable ones. (4) Design proposals need to create more than aesthetically and functionally pleasing places. They need to consider their short, medium and long-term impact beyond their immediate surroundings. (5) Thereby, the future can become “an object of manipulation, discussion, debate, and eventually, perhaps, even consensus” (Wachs, :372). Design becomes the medium for debate between decision makers, planners, institutions and the general public. Ideally, urban design can thereby create places of identity by taking into account the interest of a diverse group of stakeholder and by unlocking the potentials of a trans-disciplinary design process (Mayer, :144). The following case studies are going to illustrate this approach in practice. 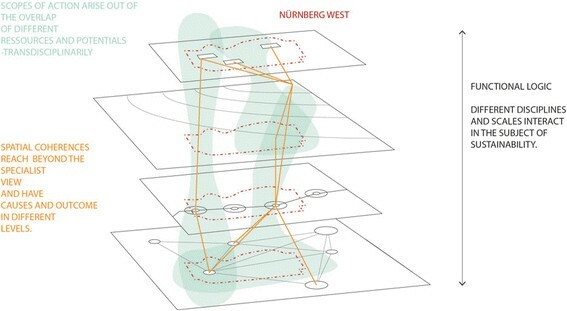 The two cases of Nuremberg West and the Munich Perspective approach the integration of urban design and urban strategy making from two complementary perspectives. While the case of Nuremberg West starts with a clearly delimited quarter within the inner city, the Munich Perspective takes the whole city as a starting point for its investigation. Place-making is an essential part of both projects and is actively promoted by integrating the different defining aspects of space as outlined in the first section. Nuremberg is a second tier German city, which faces structural change and competition by more prominent economic hubs in its vicinity. The project ‘Nuremberg West’ (NW) was initiated in 2010 in order to develop a vision for a sustainable development process (TUM, ). Well-known industrial conglomerates such as AEG, Quelle and Triumph-Adler had occupied the area until their recent closure. The area is physically separated from its surroundings by a river on the north side and a motorway to the south. The city of Nuremberg commissioned the TU Munich to develop a strategy focused on social and environmental sustainability. The interdisciplinary team included specialists from energy studies, transport engineering, landscape architecture, geography and urban design. The following paragraph discusses the role of the five competencies to a strategic approach of urban design in the case of Nuremberg West. Sustainably transforming an industrial inner-city quarter, calls for a multi-scalar and interconnected approach. Thus, NW can neither be treated as an ‘island’ , nor can individual building complexes within NW be tackled in isolation. The former distribution centre of one of Germany’s largest mail order companies Quelle will help to illustrate that. The listed building is abandoned since 2010 and covers a gross floor area of more than 250,000 sq. m – more than all commercial spaces within the city centre of Nuremberg together. An urban design competition in 2011 remained without effect as it ignored the overall framing conditions of NW as a whole. In contrast, the project team took the specific resources of NW as a starting point for an in-depth analysis. The word ‘resources’ refers to functional, physical and organizational urban resources. These are currently underutilized but strategically valuable potentials and means, which the urban redevelopment process can activate and allocate. The re-development builds critically on the integration of existing actors, motivations, interests and the resultant availability of means and dynamics for potential development paths. In a first analytical working stage, the individual disciplines set forth their view on NW. The different perspectives helped to reveal the resources for redevelopment. Figure 2 illustrates these conceptions and the scope for development, which emerges from combining inherent resources in newly developed fields of action. While the building stock and the existing urban fabric had been clearly visible resources for initiating an urban transformation process, the more important ones in NW were rather invisible. The strategic geographical position of the city-quarter within the Nuremberg Metropolitan Region (NMR) and its high accessibility might be a key transformative force. Interplay of different disciplines and scales in the subject of sustainability in NW (TUM,). In the next step, a ‘futures thinking exercise’ complemented the analysis of urban resources (Alaily-Mattar et al., ). A trend analysis examined alternative future development paths. Looking 40 years into the future helped to step away from today’s restrictions and pressing problems and to open up the view for the long-term dimension and impact of potential spatial interventions. Futures thinking is a collective process, firstly within the interdisciplinary team and secondly in a series of workshops with local authorities. In the end, three alternative futures for the spatial transformation von NW had been identified: each uses the existing resources of NW in a distinct way and assigns a specific role to NW within the NMR. Each alternative future is feasible and potentially desirable, but cannot be realized without increased and strongly impact-oriented efforts. Urban design interventions have always an impact on different scales. When trying to conceive the impacts of spatial interventions, the time axis is the primary structuring element. Hence, futures thinking and impact orientation are strongly interrelated. Facing the debris of structural change in NW, a main issue is to understand the spatial preconditions for the functional transformation process. The spatial interventions at the right time and combined in the right manner have the capacity to trigger dynamic processes. In a city-quarter such as NW, urban design can be interpreted as a practice of spatial intervention. This perspective differs substantially from any attempt of master-planning. Selectivity is an essential prerequisite for this approach – focused interventions capitalize on and activate specific resources. Based on the future thinking exercise, the team identified a plausible development path for the Quelle building (Figure 3). The proposal for the transformation selects existing activities in the adjacent urban blocks as a starting point. Interventions in existing buildings, public spaces, green spaces and housing prepare the ground before tackling the Quelle building itself. Improvements of the streetscape, a new light rail link to the city centre and a stop for regional trains are considered to be important preconditions for establishing new mixed-use activities within Quelle. For this purpose, the proposal cuts apart the monolithic building block, so that public spaces could penetrate the formerly self-contained distribution centre. Identifying the right time and order of interventions is key to this type of urban design activity. The gradual reintegration of the Quelle distribution centre into the urban grid and functionality as a process of place-making. The project ‘Nuremberg West’ stood in the very beginning of the intended long-term transformations process of NW. Within this early planning phase, the urban design is not aiming at a plan as a final product. It has to consider its design as flexible product with a strong emphasis on the transformation process itself. The urban design approach makes urban strategy-making tangible and – following the principle “visualize desires, not cities” (Burkhard, :169ff) – desirable. Alternative futures become vivid and imaginable for political decision makers, planning authorities and citizens. ‘Futures thinking’ facilitates public debate on goals and priorities, which in turn informs the future transformation process of NW through collective learning. Alternative futures, however are not an implementable blueprint for urban development, but rather a tool to create awareness among a diverse range of stakeholders for an impact-oriented, strategic approach that provides for different contingencies at the same time. While this first case study referred to a specific city quarter, which is developed for its own benefit albeit in reference to resources in the wider context, the following case aims at the identification of quarters or areas in the city, which are critical for the development of the entire city. The project integrates the five competencies of spatial strategy making as follows. Instead of starting with spatial issues, the first step of the project established the challenges for urban development on functional grounds. This step included a trend analysis on a global and local level, the prioritization of problems as the result of many discussions and a thematic concentration and concretion. The actual challenges arose out of the interplay of global trends and the specific context of the city of Munich as well as the already ongoing debates in urban development. Based upon these challenges, the team proposed a first draft of guiding principles (Figure 4) and a preliminary motive considering the existing targets and strategies. These principles formed the core of the project and were subsequently tested for their practicality. Four strategic guiding Principle for (Spatial) Development (Thierstein et al.,). Spaces of activity in the ‘Perspective Munich’ (Thierstein et al.,). Taking a strategic perspective on the whole city as a starting point, the update of the ‘Perspective Munich’ emphasises the link between overall goal-setting and the coordination of place-making activities in city-quarters and on individual properties. The project group, consisting of expert representatives of the city council, had the task to link the outcomes of the foregone functional debate to the needs and constraints of the physical urban context. The project introduced an intermediary scale called ‘spaces of action’ (Figure 5). These spaces are exposed to a mix of functional themes. As a tool, these spaces of action are deemed to be crucial in order to relate the strategic guiding principles to real spaces within the Munich context. They are therefore a critical step towards a spatial strategy, which relates to all aspects of space. Spaces of action are identified from two perspectives. From a bottom-up view, they are areas with a high potential for synergies between the spatial impacts of different sectoral projects and programs. It is the multidimensionality of existing and future activities – functional, political, spatial and symbolic – that, if well connected, multiply their effects. The expected cross-border synergies demand for the coordination of spatial and functional impacts over time. From a top-down perspective, these spaces are especially suitable to implement the strategic functional themes of the ‘Perspective Munich’ by the help of hands-on city development and urban design activities. An expert’s workshop revealed the multi-scalar relevance of the guidelines as well as their applicability in different stages of the development process of a space of action. However, not all guiding principles were equally easy to apply in the material context of spaces. There were for instance thematic interrelations, which extended across the entire city and lacked any sort of concentration in physical space. 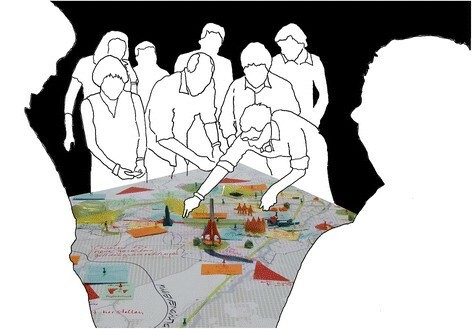 During the subsequent evaluation of the workshop findings, three temporal stages of ‘spaces of action’ emerged: ‘project spaces’, which pick up on current development dynamics, ‘observation spaces’, where the status quo needs to be further established to define a need for action, ‘cooperation spaces’, which span beyond the remit of the city and urban catalysts, which are capable to propel urban development in themselves. The coincidence and concentration of these qualities guided the following establishment of eight key spaces of action as an interim result. All of them assumed to have the potential to stimulate development city-wide. The update of the ‘Munich Perspective’ draws conclusions from both, the comprehensive spatial planning of the 1960ies and the non-spatial urban development strategy of the 1990ies. Comprehensive spatial planning turned out to be inflexible – in the very moment of the political decision the plan was already out-dated. By contrast, non-spatial strategies lacked any approach to conceive impacts spatially. As a consequence, large-scale urban projects run in parallel to and were insufficiently coordinated with the overarching strategic perspective. 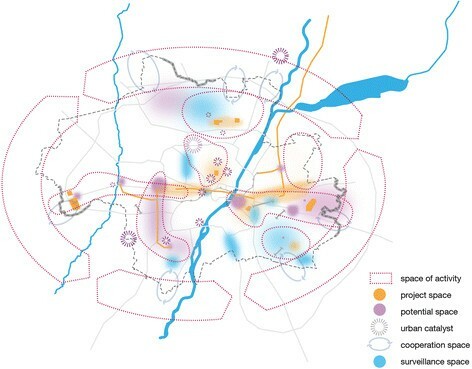 The spaces of action of the Munich Perspective are a selective and adaptable strategic framework that demands individual projects and activities to generate an added value for the overall urban development of the city of Munich. Spaces of action bridged the gap between different administrative units and sectoral issues. The interactive workshop with local authorities revealed the communicative potential of locating and visualising functional themes collectively (Figure 6). Within the fuzzy boundary of each space of activity, relevant stakeholders and their respective spatial projects and activities could be identified. After the end of the ‘Munich Perspective’ project, a public participation process was installed. The spatial references of the Munich Perspective largely supported the dialogue with the public. Public workshops and an online-participation tool helped to experience place making as a multi-scalar, cross-sectoral communicative endeavour. Interactive expert workshop on localising development principles. Starting with a dynamic thematic debate and the functional requirements, the ‘Munich Perspective’ has methodologically integrated different spatial dimensions into an integrated framework on the city level. The spaces of action are seeking to selectively propel development, where synergies can be captured. 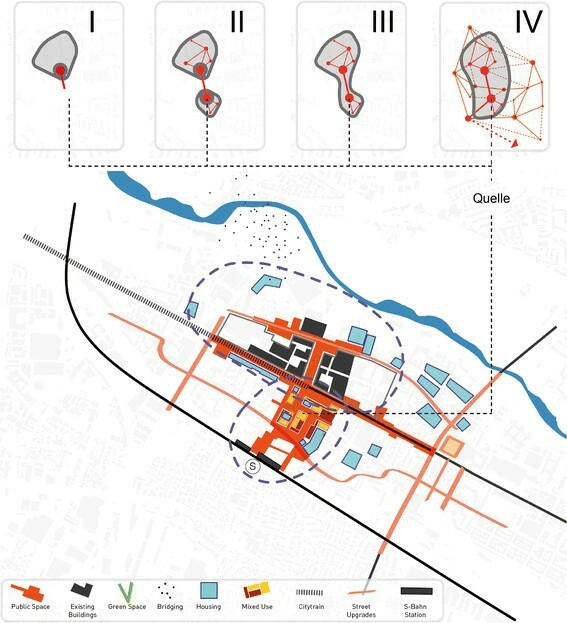 Although, the two case studies differ in scale, focus and the way, in which they have been initiated, both projects actively acknowledge the fact that all places within an area are highly interrelated on a spatial but also on a functional level over time. (2) They both are set in an early stage of the development envisioning possible futures for individual places and the city as a whole. (3) For achieving these futures, structural and non-physical interventions have been developed. They capitalise on place-specific and global resources, rather than the adoption of normative disciplinary-driven concepts (Madden, :658). Unlike Ellin () we do not believe that “there is now a virtual consensus among planners and urban designers about what constitutes good urbanism” (Ellin, :1), because “just as post-modern sensibilities in urban design are turning into new orthodoxies, a new wave of modernism is moving to the centre stage” (Madanipour, :191). However, we do support Ellin’s plea for focussing research on the process of urban design, because the uniqueness of every place limits the transferability of normative disciplinary-driven design concepts. (4) The combination of individual interventions with an overarching development framework merges the strengths of both: the comprehensiveness of an individual design solution and the leading attribute of the imagination of an overall strategic alternative future. Coordinating both requires the effective use of methods for analysing, visualising and communicating (Förster, : 61ff). In this regard, our concept highly differs from Ellin’s VIDA process (Ellin, : 84). She puts emphasis on the ability of urban design to envision the future and to inspire other stakeholders and actors. We believe that it isn’t the visionary power that sets urban designers apart from others. It must rather be the analytical expertise of combining and transcribing the knowledge and ideas of stakeholders into pro-active impact-orientated design interventions (Alaily-Mattar et al., : 11). (5) This slightly adjusted understanding of the designer’s role helps both projects to foster a positive collective perception towards the inside and outside of the city enabling a debate about our future city and a mutual effort towards a positive urban transformation. Place making is a highly complex task due to the interrelatedness of physical space and non-physical activities and due to the interdependency of multiple places across space and time. Therefore, urban designers must acknowledge the fact that master planning, as a static shaping of the physical dimensions of a place, cannot prepare urban development for dealing with all contingencies. Handling future challenges requires the dialogue between disciplines and the focal point of the debate must be the transformation of place rather than normative concept. Urban design teams must bring together the competencies to understand and allocate all place-specific and global resources. Design has to be understood in a broader sense. It is not only about designing a place but also about designing its spatial transformation process. It is thereby part of the public discourse, in which design teams could foster alliances of stakeholders to strategically facilitate the production of places. Our approach derives from large-scale urban development studies and should not be understood as a blueprint for a new urban design practice. Both case studies are experiments on how to conduct urban design under our relational conception of space. Our experience does support the importance of the outlined key competencies and goes along with other recent contributions to the debate (Eisinger, ) by equally emphasising place-specific solutions and the process of achieving them. We feel obliged to continue our exploratory research by testing and evaluating our approach in more cases. At this stage, we hope that our contribution invites other scholars to re-think their own urban design instruments and tools, because existing methods do not seem to be sufficient enough to effectively facilitate a process of spatial urban transformation. AW, AF and AT have been involved in both case studies. AW drafted the initial manuscript. AF provided further detailed description on both case studies. LG contributed to the conceptional and the discussion part of the paper. All authors read and approved the final manuscript.